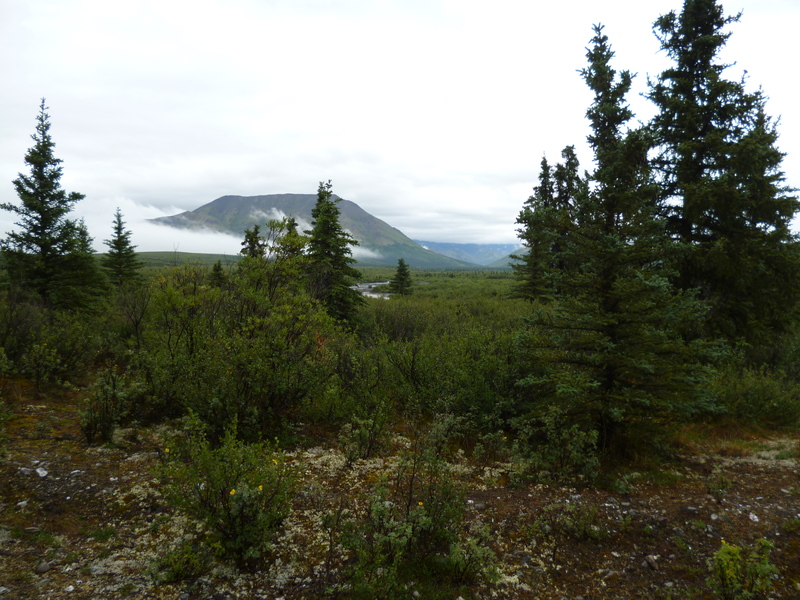 We headed south from Fairbanks to Denali on a nice rainy day. The two hour drive was mostly in thick fog and rain, but very relaxing. 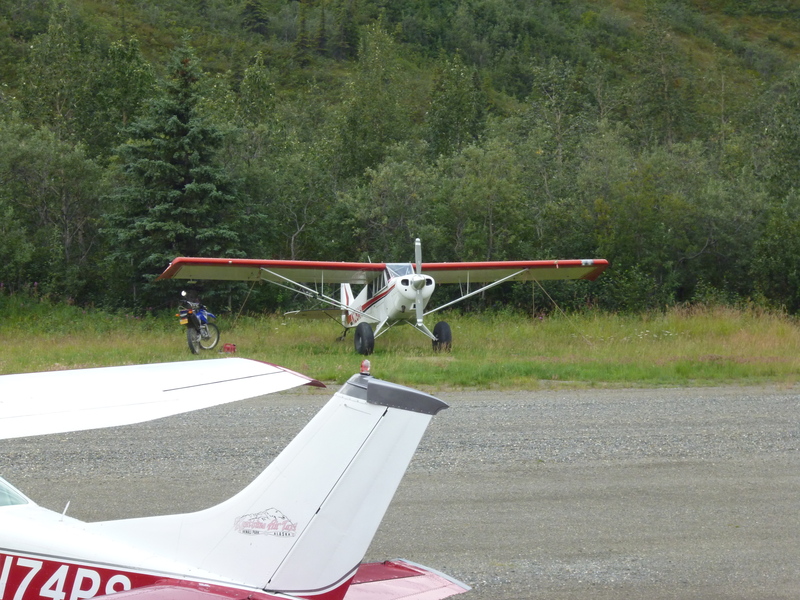 We stopped in the small town of Nenana, which is about the halfway point along the Park Highway to Denali. 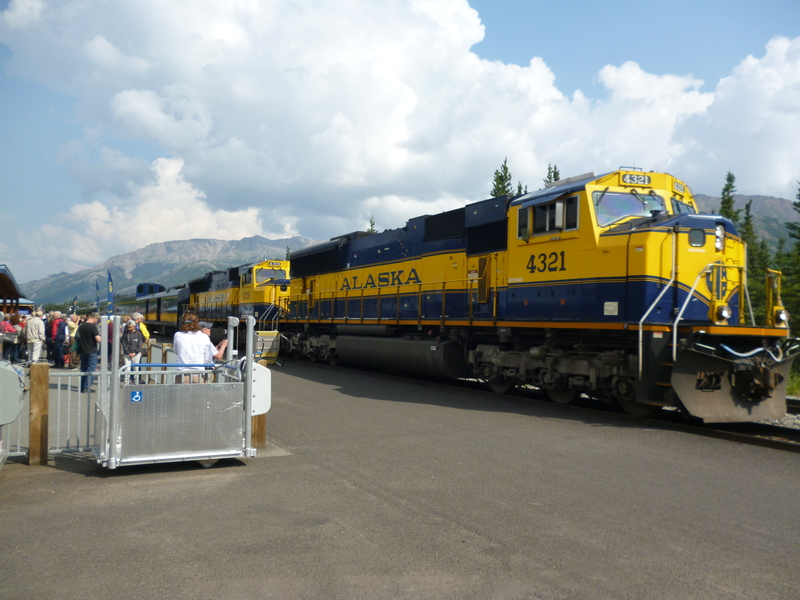 It is strategically situated at the confluence of the Tanana, Nenana, Yukon and Chena Rivers with barge operations from a train depot that runs from Seward to Fairbanks on the Alaskan Railroad. 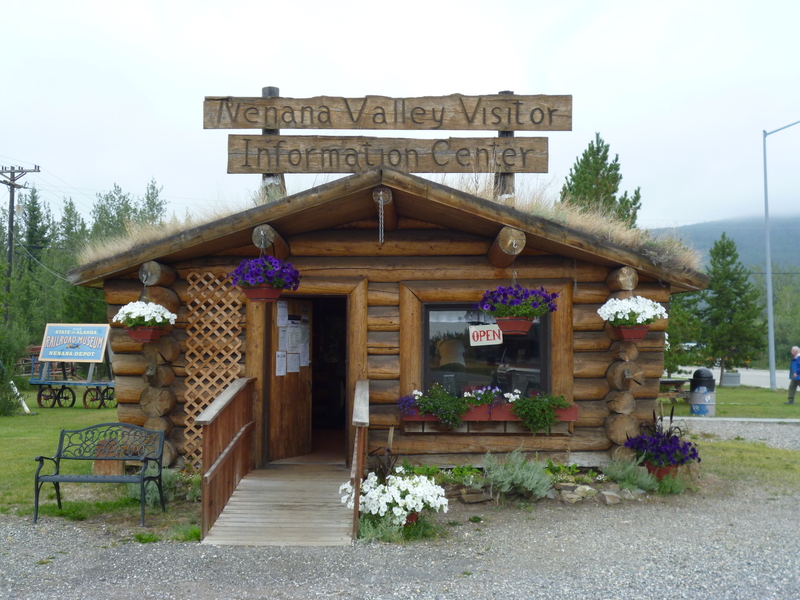 The visitor center was a great source of information. 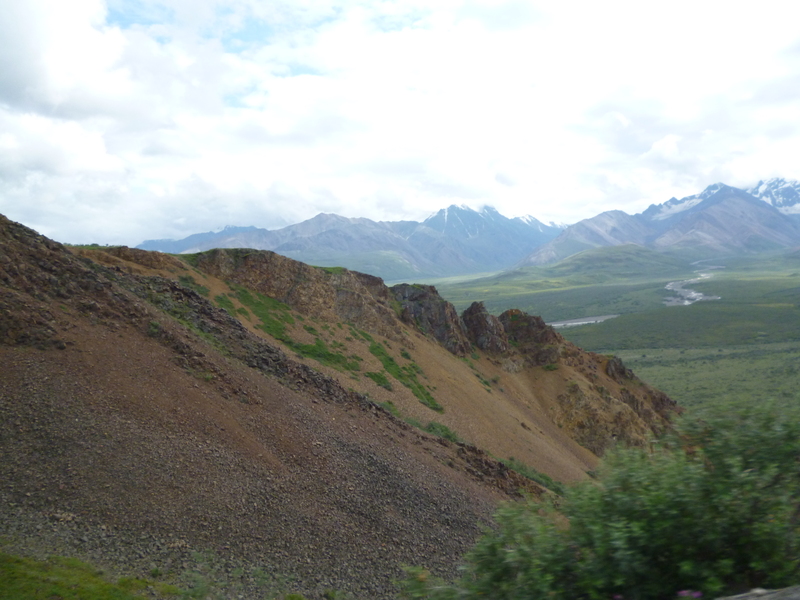 This small town was the logistic launching point for a few of the gold rushes into the interior of Alaska, where most of the goods arrived by train and were then transported along the rivers to their final destination. 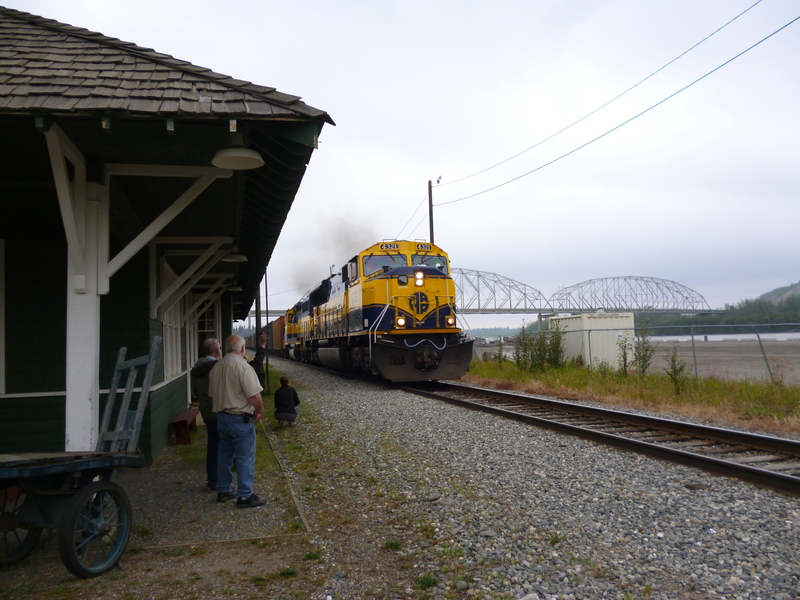 A train came through as we were visiting the train depot museum. 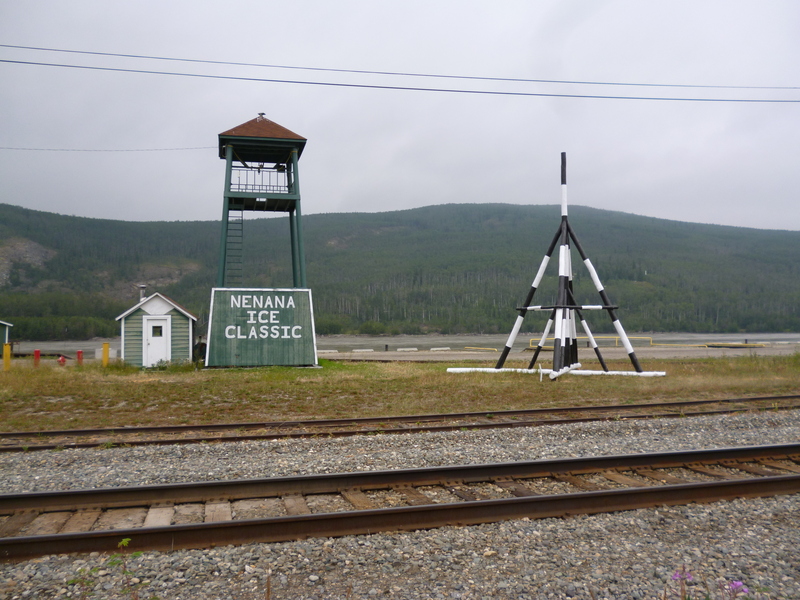 Nenana has the Ice Classic, where folks have been guessing since 1917 when the winter ice on the Tanana River breaks and begins to flow. They mount a huge tripod into the ice in the middle of the river and connect a cable from it to a tower that records the official time, down to the month, day, hour and second, once the tripod moves 100 feet from the tower. It’s a huge deal and they publish the names and time entries in a book for every year that is at least 2 inches thick in very small print. The winner gets the lottery prize money, which in 2015 was $330,330. We bought two $2.50 tickets for the 2016 Ice Classic as part of our retirement investment plan – lol. 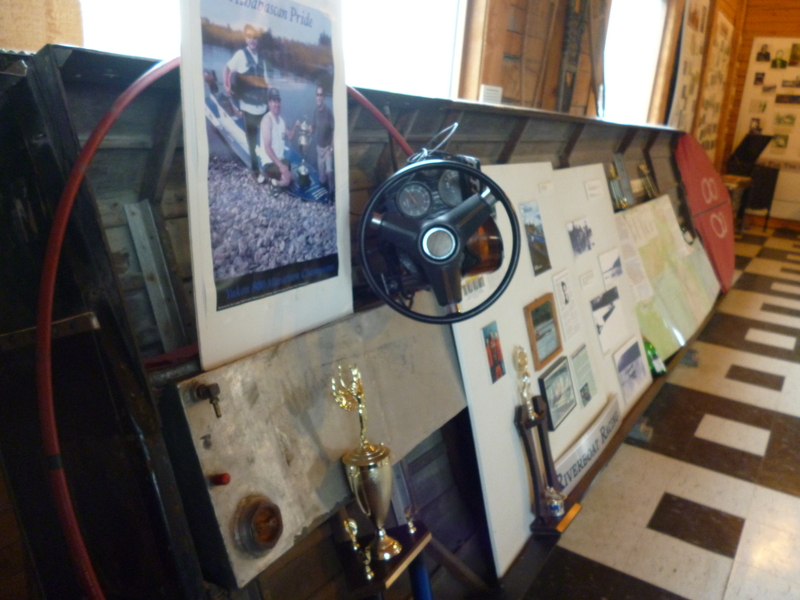 Given the river history of the town, they also have the 800 mile river race in some pretty fast, very low draft boats that are averaging nearly 40 mph for the entire run. We didn’t see all the rules, but alcohol ballast must have been one of them. 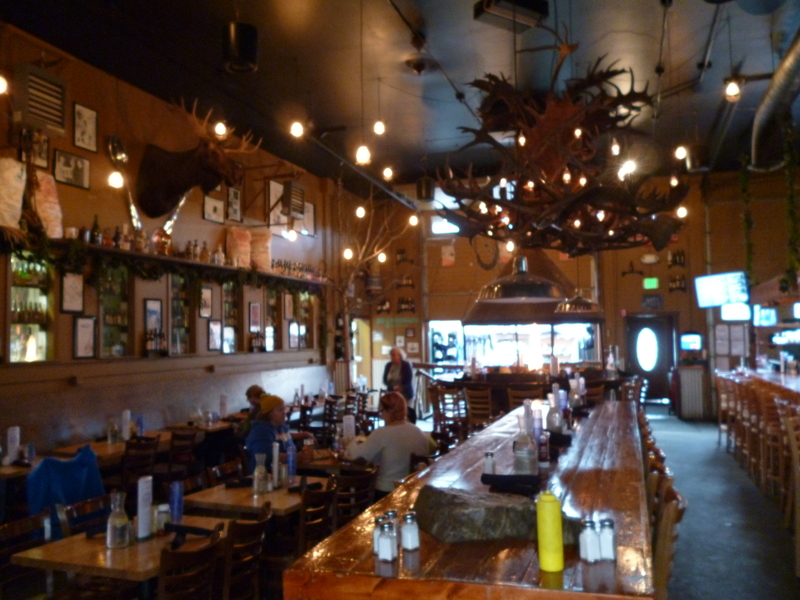 Before entering Denali National Park we happened to pass the 49th State Brewery and stopped in for a sample of their beers and a bite to eat. The place was very interesting and their beers were pretty tasty. 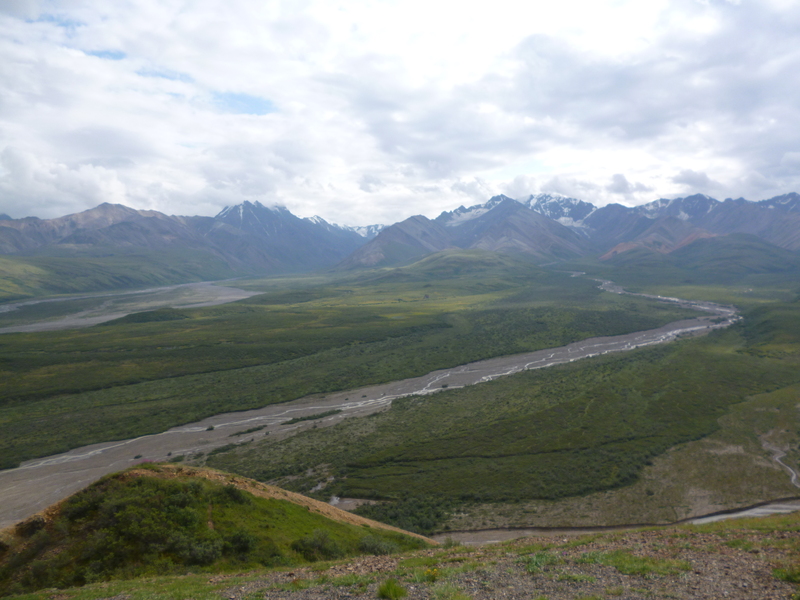 Denali National Park is roughly the size of Massachusetts, but it has only one road and the general public can only travel to mile 15 of the 92.5 miles along the road. 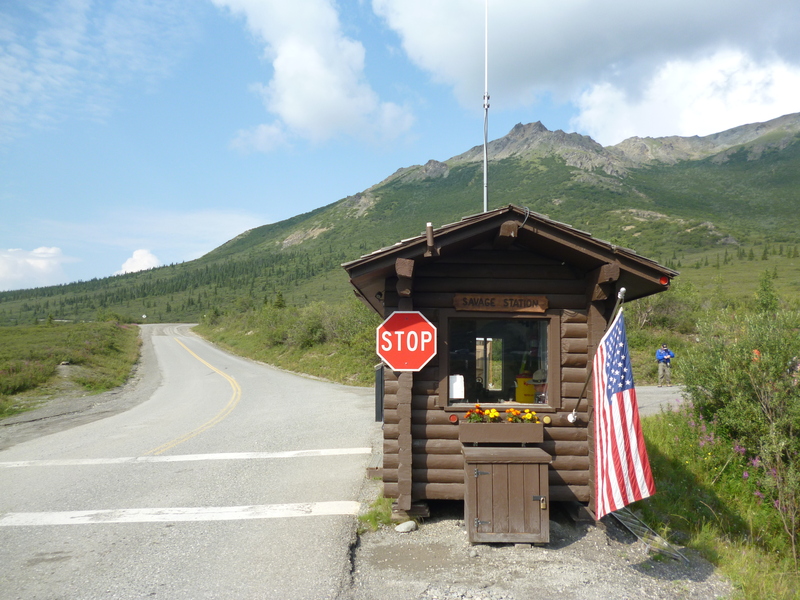 There is a ranger station at mile 15 that enforces the travel restrictions. You have to take a park shuttle to go further into the park, and they run very regularly. After visiting Yellowstone and Yosemite, I think Denali has the right idea. The interior of the park is just for bikers, backpackers and those going on one of the many shuttle bus excursions. The restriction is on all motorized vehicles: cars, motorcycles and even snowmobiles in the winter. The beauty of the park is incredible, and the lack of cars makes the wilderness experience much better than at any other National Park we’ve been to yet. 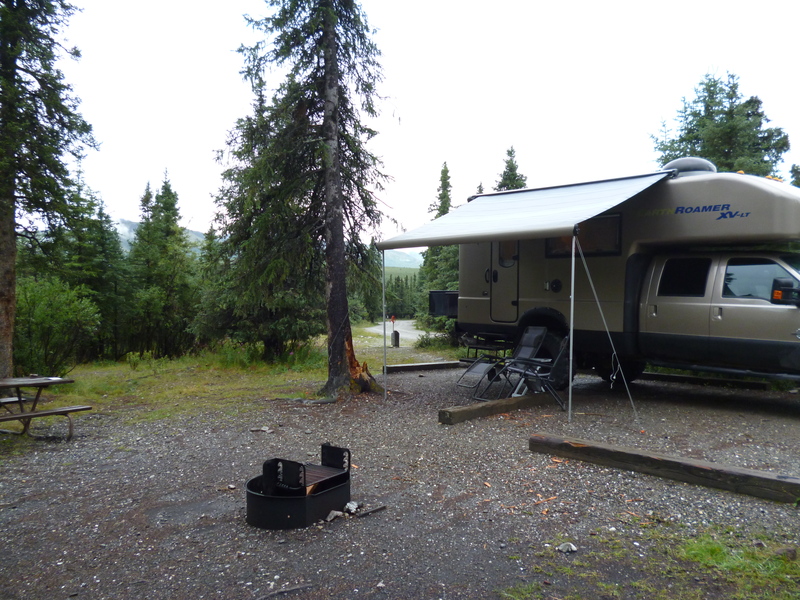 Since this was our first time to the park, we camped at the Savage Creek campground at mile 12 along the road. 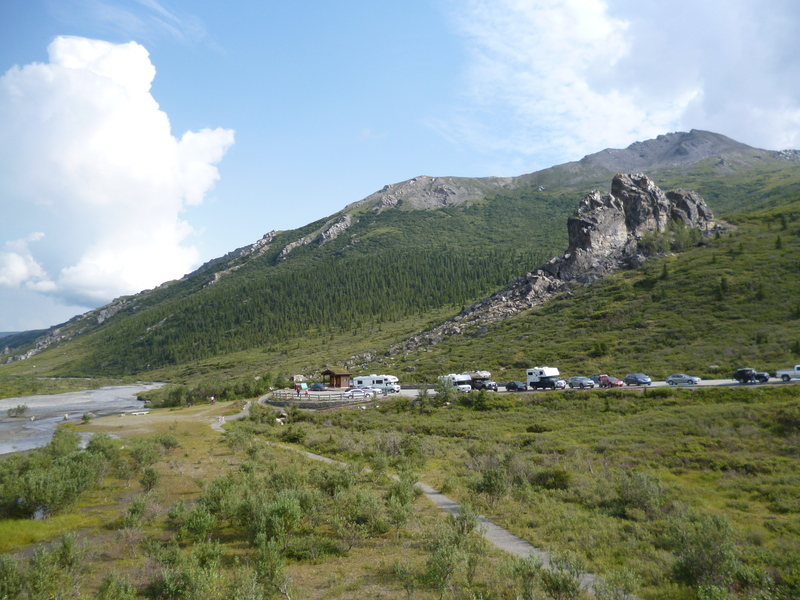 This is the furthest campground into the park you can drive into and still have the freedom to drive in and out. There are campgrounds beyond mile 15, but once you are there you have to stay there your entire duration, using the park shuttles as the only mode of transport. 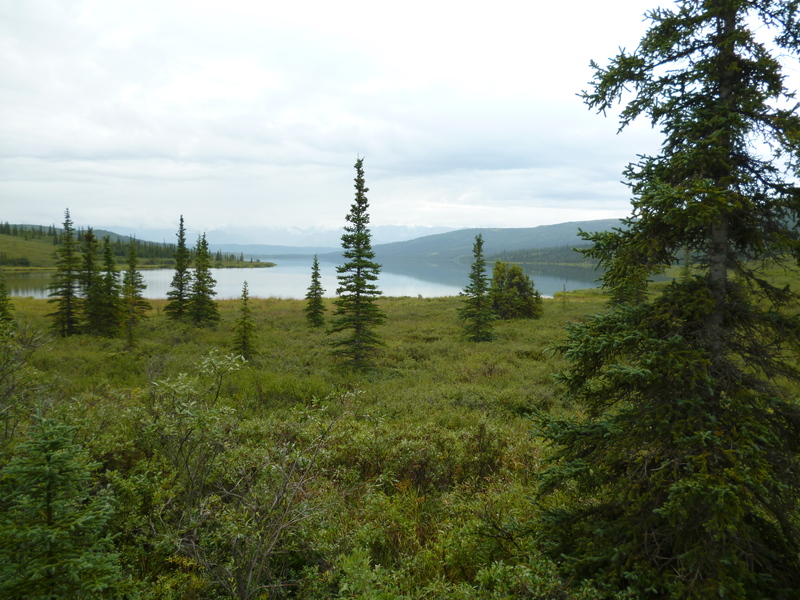 A few campsites further in can only be accessed by shuttle buses. I guess that would rule out the Roamer. Now that we know what to expect, we may use the shuttles next time, but we didn’t know so we did the Savage Creek option this time. 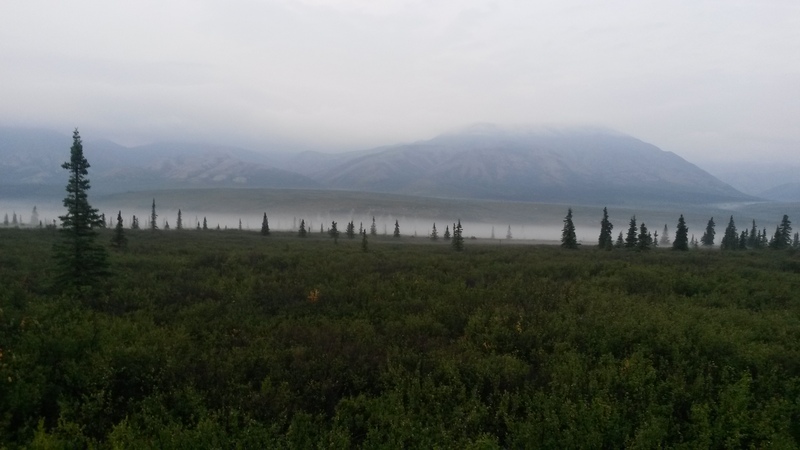 The rain from Fairbanks down to Denali had nearly stopped by the time we arrived but the fog and clouds around the campground were awesome. We did a nice hike along the creek near the campsite, where they had boards telling the history of the first 1917 park camp at the same site along the walk. We signed up for an 11-hour bus tour to the end of the road and back to see as much of the park as we could for this first time. The forecast was for rain all day. It drizzled in the morning but the clouds began to break when we reached the end of the road, and it was sunny on our way back. The cool, moist morning weather meant that all of the animals were out. 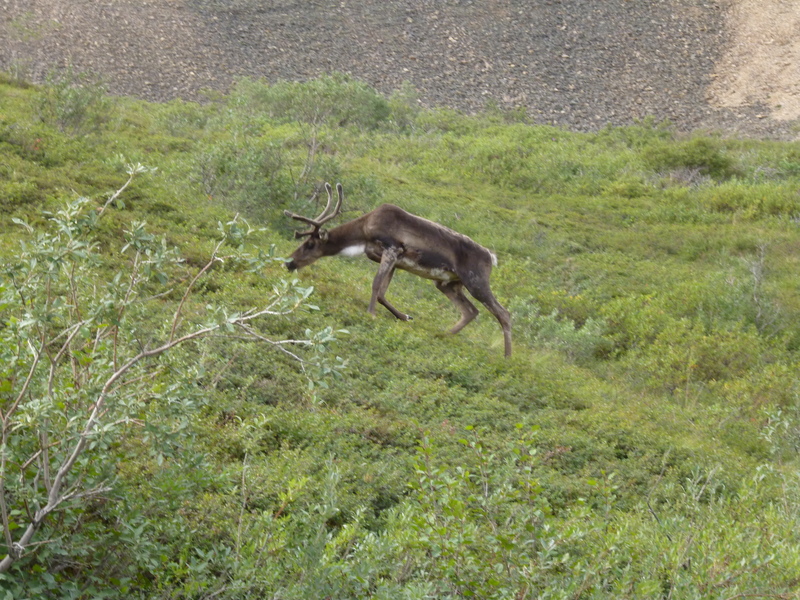 We saw many moose, grizzlies, Dall sheep and caribou during our trip. 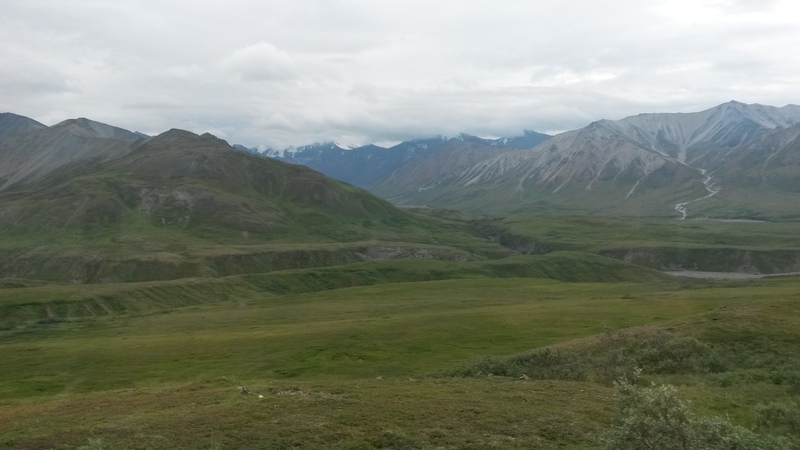 The park was originally set up to protect the Dall sheep because mining hunters were killing them by the thousands to feed the miners and to force the price up by killing more than required. We saw about 20 sheep dotting the steep rock cliffs way up in the mountains along the route. 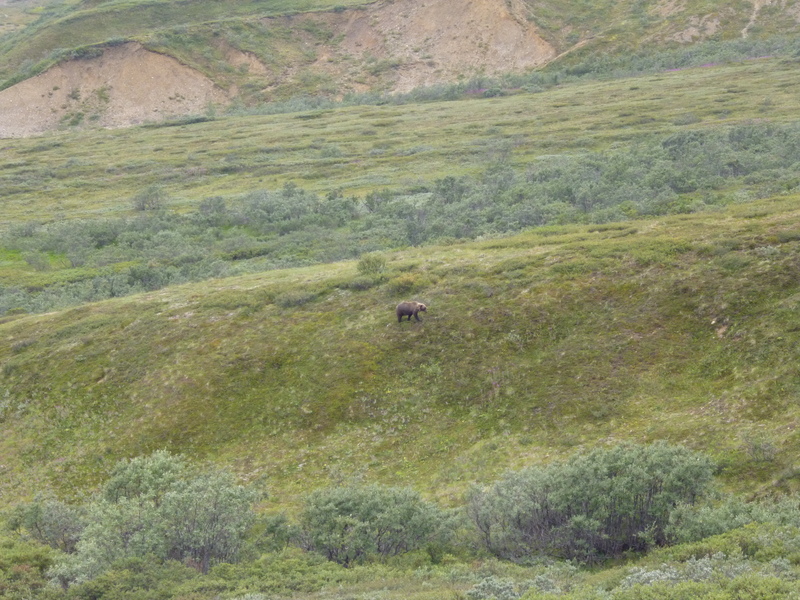 The tundra ground is covered in berries and the bears were just hoover-ing up as much as they could to pack on the winter weight. We ate a few blueberries on our hikes and they are almost ripe, but I guess the bears aren’t too picky. 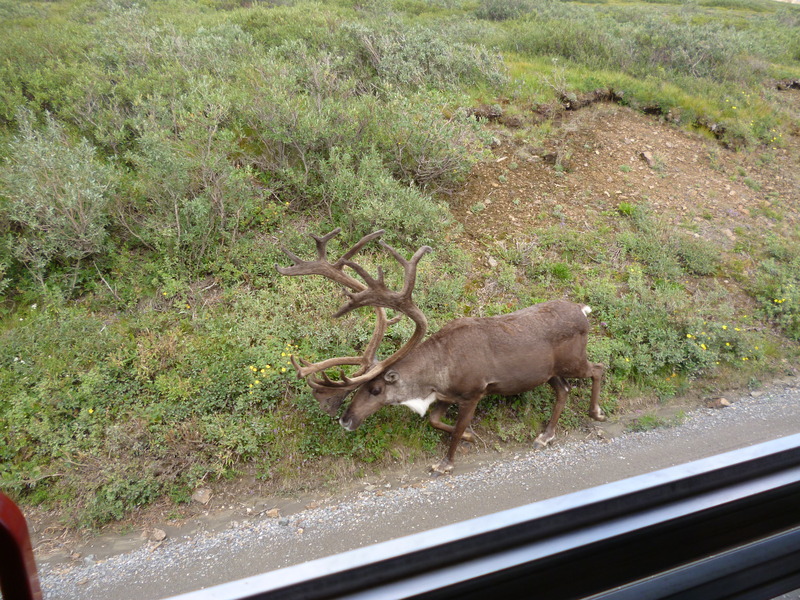 This caribou, with an awesome rack, walked right past our bus. 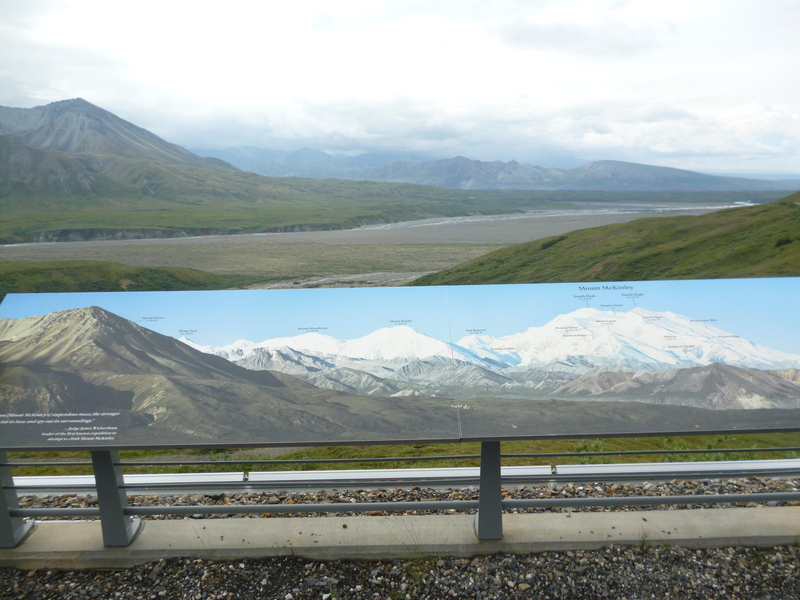 We didn’t get to see Mt McKinley because of the clouds, but a picture board below the actual landscape at one of the stops showed what it would have looked like. 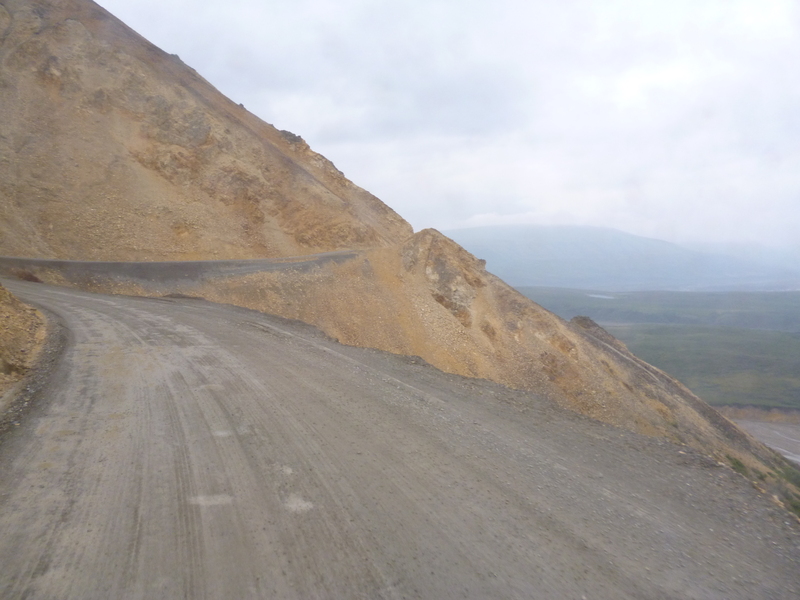 At 20,320 feet, the mountain would be hard to miss. 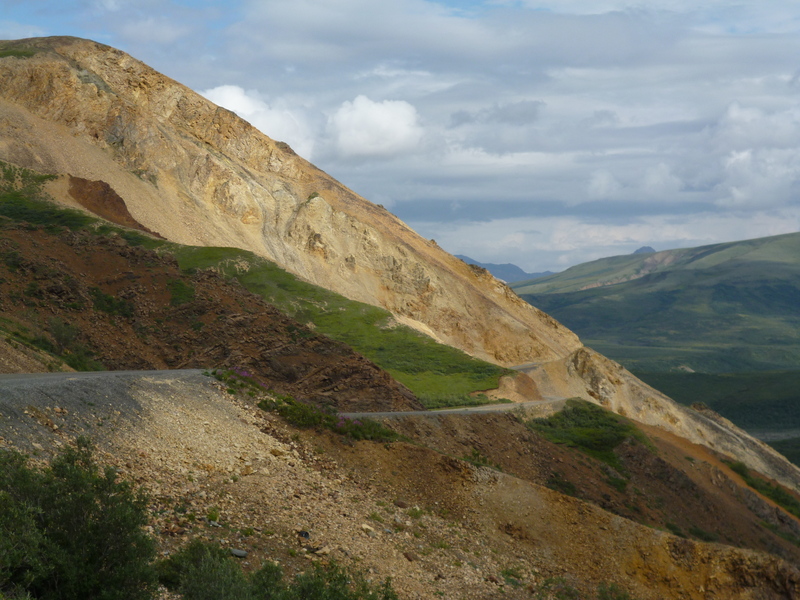 Mining operations at the end of the road were shut down in the 1980s, but a few claims are still held privately, with a grass runway back there to help service the folks who live back there still. We found out during our tour that this year had an unusual late freeze in mid June that killed nearly all of the mosquito population. It would explain why we have never had a problem sitting outside in the evenings. It’s the best it’s ever been the locals say. Most of the folks who first visited the park came by train. 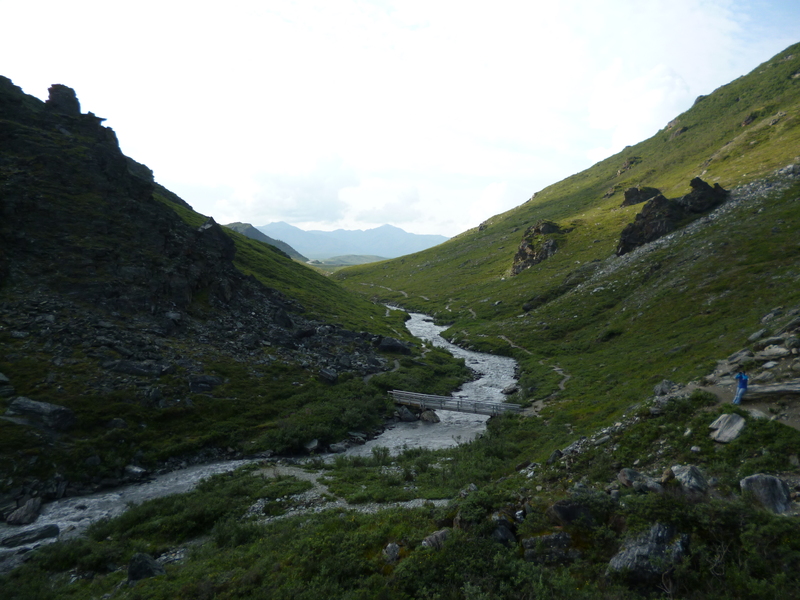 Given the restrictions on cars, maybe our next visit will be by train from Seward and then camp at one of the more interior camps. 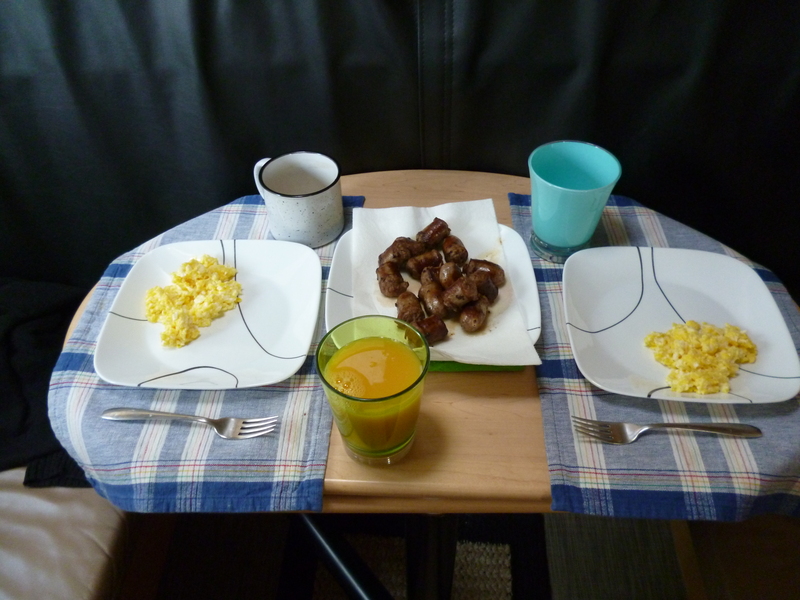 The next day began sunny so we started the day with reindeer breakfast sausage and eggs. The sausage had a hint of sage and were really good. Between yak and reindeer I think both of us would pick the reindeer – very tasty. 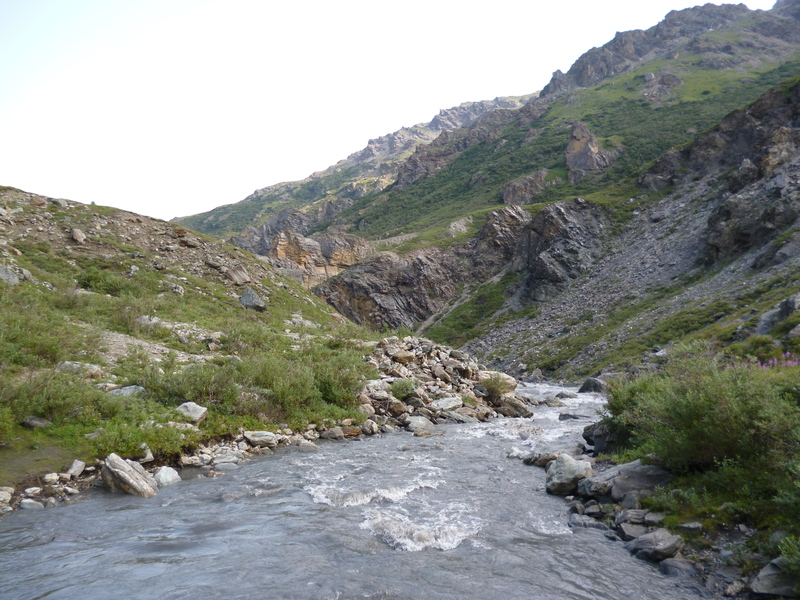 We then headed to a trailhead to hike a stretch of the Savage River. The hike was beautiful. Everything at the park is given that frontier look. 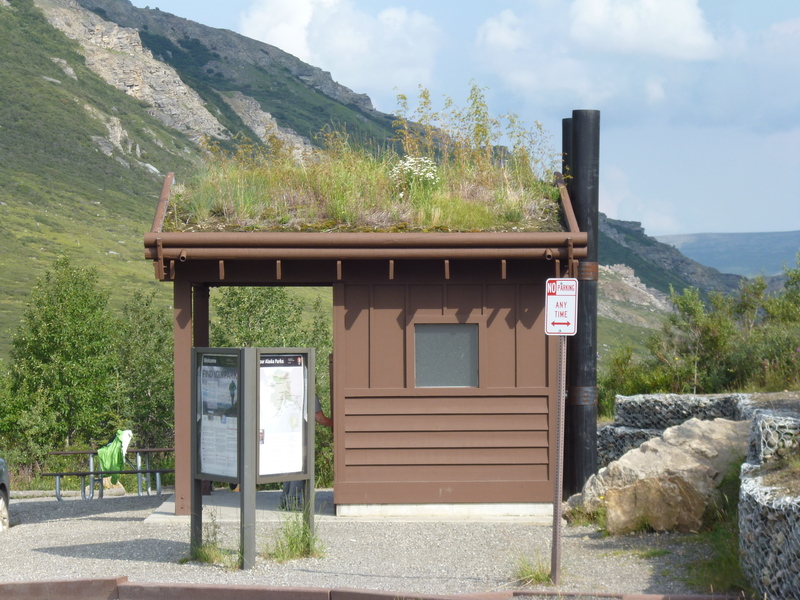 Even the outhouses have grass roofs. 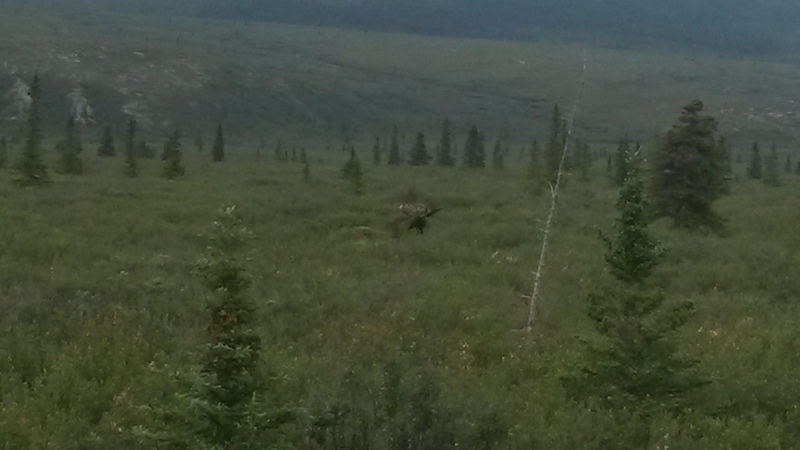 On our way back we saw our first bull moose in the field eating willows. He was about 100 yards out and his rack was huge. We sat there in our car with another shuttle bus for some time. However, another car pulled up and the folks got out. The moose instantly took notice, stopped eating and locked onto them. The park tries really hard to keep the animals wild by preventing them from associating people with food, or in the case of the grizzlies, as food. As we pulled away a ranger was approaching and I’m sure he made them get back into their car. 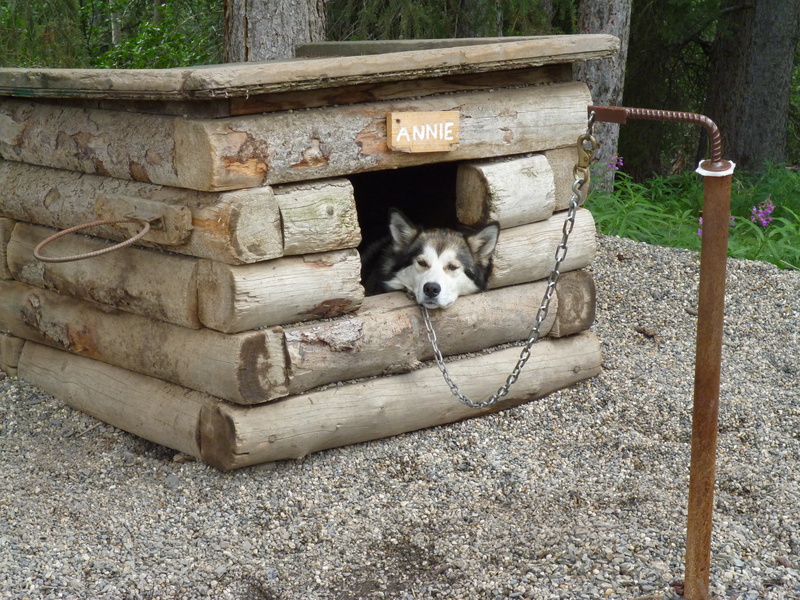 The park has their own sled dogs that help to patrol the park in the wintertime. We went to the doggie demo to learn more about the dogs and the rangers that utilize the dogs in the winter. 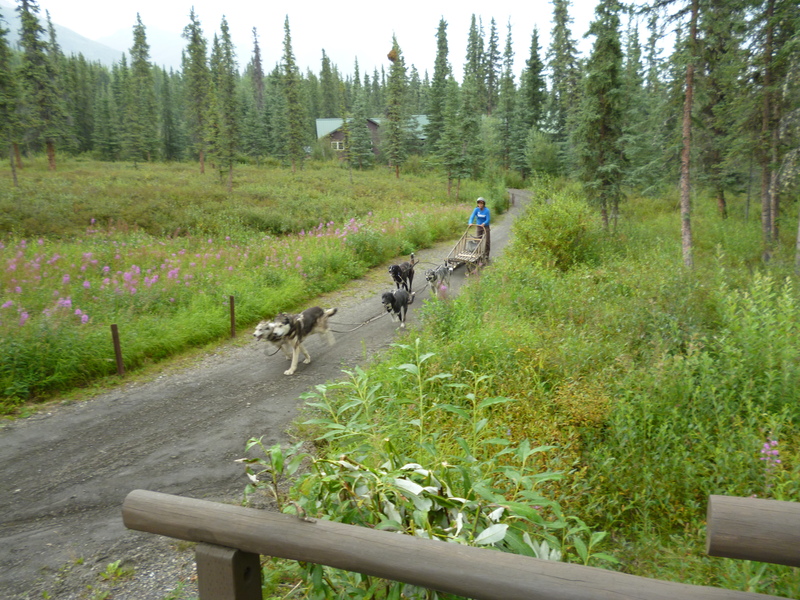 The dogs cover over 3000 miles in the winter, and seeing the park, it’s definitely the way to go – by sled dog. The Alaskan huskies are a working dog where the sleds are packed with supplies of 50 to 100 pounds per dog to pull through the snow. Their coats are said to be ideal for -10 degrees. They were looking a little relaxed when we arrived. They did a sled demo with five of the dogs. All of the dogs were howling to be one of the five picked to pull the sled. They cover 25 miles a day and ranger cabins are spaced that far apart through the park so that they can patrol the area all winter long. Maybe we’ll get to see the mountain peak during our time in Alaska, maybe not. 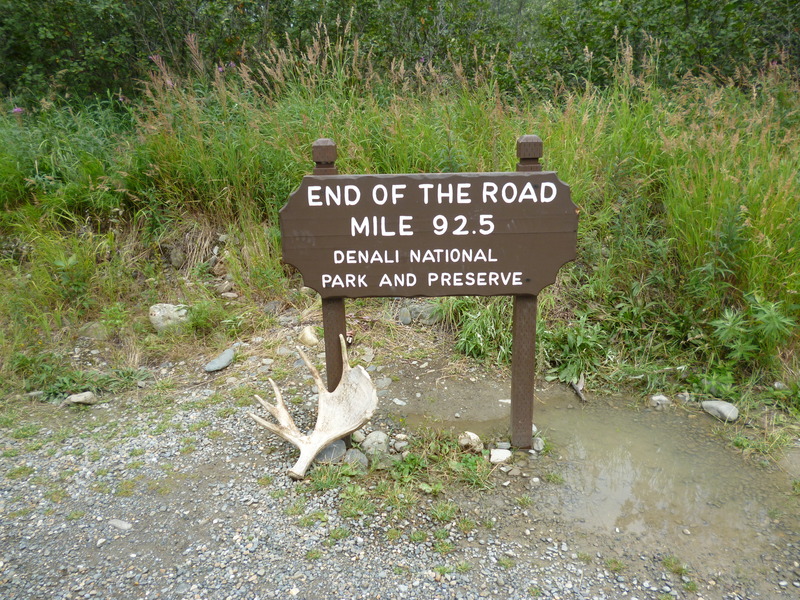 Either way Denali is a great park that we’ll be back to visit again. Like the film at the visitor center explained about climbing Denali, because of the altitude (no oxygen bottles allowed), weather and route conditions, relative to all of the other great mountains, including Everest, Denali should be considered a final exam and not a starting point for beginners. We’re off to Wrangell-St Elias NP now to see some more glaciers. It’s mostly dirt roads from here so it should be fun.